Break free of the fears, the blanking out, and physical reactions that are keeping you from demonstrating your true ability and potential. How to Conquer Test Anxiety shows you how to apply superior test-taking skills to lower stress and anxiety - before, during, and after a test. Here's the first comprehensive strategic system for overcoming the causes and eliminating the effects of procrastination. Here are techniques to help any busy person get more things done more quickly, without the anxiety and stress brought on by delay and pressing deadlines. The Now Habit promises you the chance to truly enjoy guilt-free recreational time, knowing the work is really behind you. Download the accompanying reference guide.. I found this book to be inspiring and life changing. I too initially found the narration to be slightly slow and awkward but that worked itself out and/or the content was so terrific I was no longer distracted by it. I've listened to the good doctor's book twice and have already put a lot of his advice into practice and it has made a huge difference. Things that had been on my to do list for MONTHS have already been completed and with this positive momentum I'm actually looking forward to tackling other previously daunting tasks. Without a doubt, this is the BEST time management book I've ever purchased. Dr. Fiore warms to the task of being a narrator. During the first half of the book he seems to be learning how to narrate, but towards the end of the book his narration picks up speed and he modulates his points well. Amazon reviews show people buying several books on procrastination and saying this is the only one that helps. Be sure to download the extra material - a pdf file and print it out. 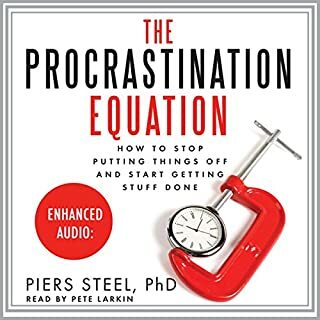 In this book Dr. Fiore provides a unique insight on causes of procrastination and some surprising strategies to deal with it. Having read some 3 or 4 books over 10 years in an effort to deal with the habit (I just never quite get around to it! ), I have found Dr. Fiore's ideas among the most effective yet. Some have commented on his narration style, and yes it is a little slow. I found turning up the narration speed on my iPod the only remedy needed. 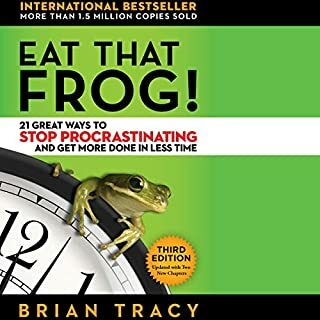 For me this book, plus 'Eat That Frog', provide everything one needs to know to change behaviour and stop procrastinating. Now it is up to me! I like the book's opening: there are several types of procrastinators, and they procrastinate for different reasons. One of those types fit me almost perfectly -- I am good at getting the big things done, but I hate all the details. Just knowing that made me feel better. The author then explores the psychological reasons why we procrastinate. He doesn't brow beat the reader saying it's bad. Procrastinating is rewarding, in fact, but only in the short term. Moving on to what to do about it, the author offers many excellent suggestions. Several strategies are simple and effective, for example stop talking to yourself as a victim, but instead make the choice to do something. I have started doing those things and they do help. There are several other things as well, which take more work. And therein is my problem. I just don't have time to work out an un-schedule right now... but I'll definitely start tomorrow. Learn from this illuminating but readily understood analysis of procrastination as a complex defense that is usually misunderstood as a weakness, incompetence, academic ineptitude, etc. Fiore illucidates the manner in which proscrastination is used defensively against other unpleasant feelings and thoughts. And why sheer will power will not over come patterns of procrastination. The author goes a step further and offers ways to "unlearn" procrastination and deal effectively with the problems that gave rise to it. Fiore isn't the greatest narrator available (he speaks a little slowly for me), the content is really great. I already own the book; having it in audio format is both revealing (I've learned a few new things) and useful for review. I have recommended this for family members who suffer -- as I do -- from difficulty completing tasks. Great content, poor delivery. I wish that this author had given over the job or reading this valuable book to somebody who could make the experience of listening to it less fatiguing. Consider buying the print version - I finally had to do that. 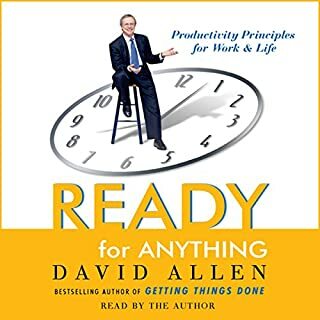 I picked up this audio book after hearing "The Now Habit" recommended on several productivity blogs whose authors I respect. This is the best book on productivity I have ever read. 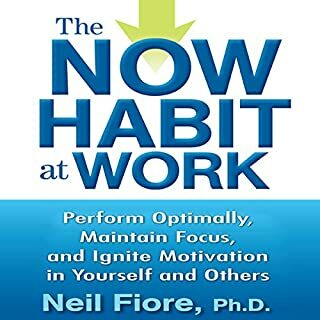 Fiore describes the psychological root causes for procrastination, and provides several very sensible and doable strategies for attacking the causes. Some reviewers have complained about the quality of the narration. Personally I think the criticisms are exaggerated. The book is narrated by the author, Neil Fiore, and he has a nice reading voice. Yes, at the beginning of the book his reading is a slow and a bit tentative, and this was mildly distracting. However, by about 1/5 into it, Fiore hits his stride and after that it was a pleasure to listen to. Fantastic. I will definately also be picking up the printed book. This book is a marvelous treatment of the seemingly intractable habit of procrastination. Fiore does more than simply address the symptoms. 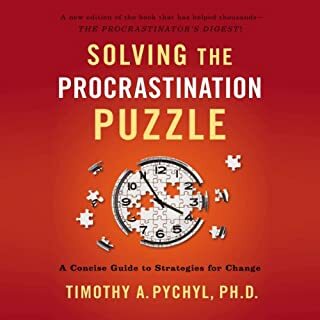 Instead, he explores some of the more common reasons why people procrastinate, and manages to do so without boring the listener with too much psycho-babble or victimhood mentality. Not terrible, but lacking in significant content and a fairly average performance. Worth a listen but don't expect too much. This was my first audiobook, and i was unsure if I could adjust to listening rather than reading a book. However, the Now Habit struck a cord with me so many times that I found it easy to concentrate. The advice is so much better than other books I've read related to procrastination. I've found it easy to put the techniques learned into practice and I'm starting to reap the rewards. I'd recommend this book to anyone who ever puts things off and then suffers with the guilt of doing so. Blew me away - he's right. The book works. I'm a terrible sceptic and have tried just about everything, including multiple courses, to deal with my procrastination. For some people it is a minor irritation, but for me it has blighted my life. I am a bright person who should have done much better in my life, and now I understand why. My degree is in counselling, but this guy has a level of insight into procrastination and the very emotional and psychological reasons for it that I totally lacked. He has done a lot of research on it and, I believe, has made a discovery. I think he really has found the crux of what causes procrastination for people like me, and it is not (for the most part) anything to do with time management or schedules. I will not spoil the book by giving away what he found, except to say that it was about two or three chapters in that I had the realisation of my life. For the first time in years I have genuine hope that I can get beyond this handicap I have carried around with me all my life. It is a relief to finally know what causes it and I can never "un-know" this knowledge. The author narrates his own book, and although he isn't the best narrator out there, you get the benefit of feeling his passion for the subject and he injects real meaning to something he obviously feels strongly about. He strikes me as a really kind and understanding person and, with my counselling head on, this is just what you need from someone who is helping you with a problem that can be as personal and difficult to face as procrastination. So, thank you very much Neil! I am not a huge fan of self help books but I have read a thing or two on the topic of procrastination, since I am one of the world's worst! Most of the concepts and information in this book were new to me and left me feeling (for the first time ever) that I might not have to spend the rest of my life in a constant and exhausting battle to get things done on time. Even if I never manage to fully become as efficient and organised as I hope to be, the reduction in shame that came from listening to this has made it a good read. loved this book. the whole journey was just a series of revelations and insights about how I work and deal with procrastination. zero pop psychology and finally some non-judgemental insights into procrastination. this book is definitely worth spending a credit on. listen, implement and finally get on with things. Good, organized and practical tips , plans and advices that generate results literally in a couple of hours. It is simply amazing! This book has this "self-helpy" vibe to it (mostly due to narration) and I was sceptical at first. I've read too many of those self-congratulatory pamphlets that just force their dogma while backing it up with incorrect facts. Too often self-help gurus just barely touch the surface levels of behavioural psychology, leaving me perplexed and doubtful. But Neil quickly dispelled these wrong assumptions as he got deeper and deeper into the root of the procrastination issues. I really found the book helpful as it expanded on the emotional psychology of time management that "The Big Leap" (the other fantastic book on life purpose and goal setting) only glanced at. I really needed to understand the habitual and sequencing patterns of behaviour and thinking that kept locking me into the procrastination mode. Neil comes up with thorough explanations and really wise advises on how to steer your mind in the right direction. Without all this uneducated hutzpah around "getting over being lazy" I see too often at "orange spiral stages". A useful book with good tips and techniques for beating procrastination without beating yourself up. I'll definitely revisit this content again. The book I've been waiting for! I've been a procrastinator my whole life, this is the only book that I've come across that really seems made just for me. Engaging to listen to, only criticism is that the recording isn't the greatest quality, a but too twangy and treblely. 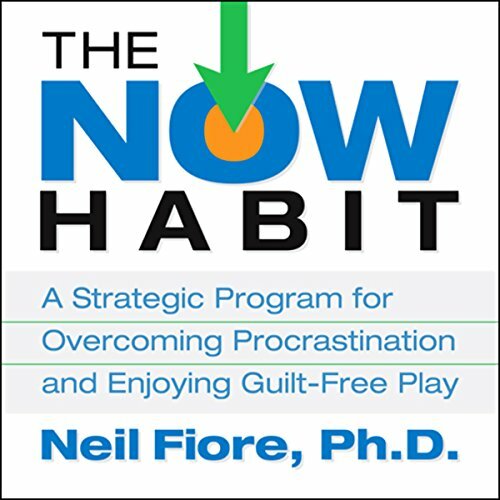 Where does The Now Habit rank among all the audiobooks you’ve listened to so far? It ranks high in content, but low in delivery. Because it offer something more useful and practical than what most people write about procrastination. What other book might you compare The Now Habit to, and why? 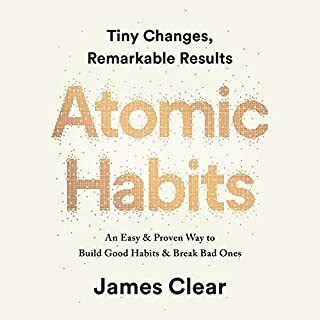 It's a combination of "Power of Habit" and "Procrastination by Jame & Lenora, because it's mindful about neuroscience and how the brain works, and it's content is quite compelling, and useful. Would you listen to another book narrated by Neil Fiore? No. He speaks a bit like Christopher Walken. He stops and.... pauses at.... awkward places, as if it's... his first... try in reading the.... script. The only thing that made me keep going was the content. - Alternative and useful ways to beat procrastination. - Beating procrastination without being nagged to "just do it"
Love the content. Hate the reader.